PIR based force detector with Particle Photon at core. How could we really feel the force? What really is the force? The force lies within us, we have to identify it. The initial idea was to use combination of sensor for determining the force. I tried using IR temperature sensor(TMP006) along with an PIR sensor for the required operation. The device thus made will monitor the environment around and notify using vibration or audio when it detects any living being. The short range operation of IR temperature sensor lead to designing of the system using PIR sensor alone which essentially could equated to motion detection/ human presence detection. It detects the motion or essentially the 'Force' and results in vibration and audio notification (on your smartphone). A passive infrared sensor (PIR sensor) measures infrared (IR) light radiating from objects in its field of view which could be equated to the force. The force detected is conveyed to particle cloud through photon. 2. Testing and setting PIR sensitivity: Testing of PIR is required to ascertain that it is functioning properly as number of PIR sensor are available in market with different specification and modes. **This project used a medium sensitivity for detecting upto 6-7 feet and very low delay time. 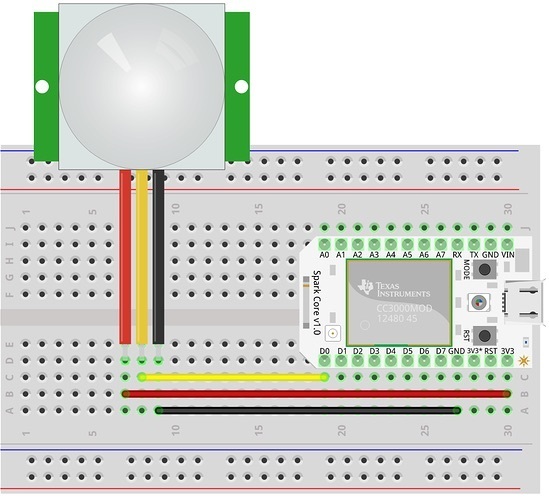 Still confused about how PIR works and setting it up, check this Adafruit tutorial. Create your own channel (Channels are push notifications feeds that can be subscribed to. Anything you push to a channel will instantly go to all of the channel's subscribers. Only the owner of a channel can push to it.) Download Pushbullet App to your smartphone or even your PC/Mac. Webhooks can be configured using the Particle CLI. You can install the Particle CLI for using the particle cloud following the instructions here. Powering the photon setup using power bank doesn't works for a considerable time period(I used 10400 mAH PNY BE-740 which was able to run setup for 10-20 minutes but had multiple issues with PIR functioning). 5. Get ready to feel the force!